A sunny Tuesday night brought hopes of Aire - Wharfe glory for two sides who have shown excellent form during two very successful cup runs: Ilkley and Otliensians would meet in the final for the third straight year, a heart-breaking penalty “shoot-out” loss still fresh in the minds of the ‘Ensians players who would look to take their revenge. The game started fast, as both side looked to assert their dominance early on. This led to some sloppy, rushed play and penalties for both sides. ‘Ensians were the first to score – winger Connor Bateman with two exceptional early penalty kicks to give the home side a 6-0 lead within the first 10 minutes. But, Ilkley were quick to pile on pressure of their own, as Charlie Ramsey answered back for the visitors. With Ilkley beginning to gain a foothold in the game it was up to ‘Ensians’ hard-nosed defence which has been the back-bone of this team’s cup success to stave off the Ilkley attack. The camradery of this tough Otliensian’s unit clear to see through their incredible defensive work ethic, as hard hits were followed up one after another by the likes of flanker Sam Featherstone, centre Ollie Eaves and lock Jack Smith. Ilkely were relentless in their late first half offence, and eventually managed to provoke mistakes by ‘Ensians’ defence, as they levelled the score at 9-9 and looked to be gaining that all important foothold as Lee O’Donnell was sent to the bin. However, ‘Ensians would match Ilkley’s aggression and force a turnover, as Will Cooper found touch, capping a phenomenal first half for the number 10. 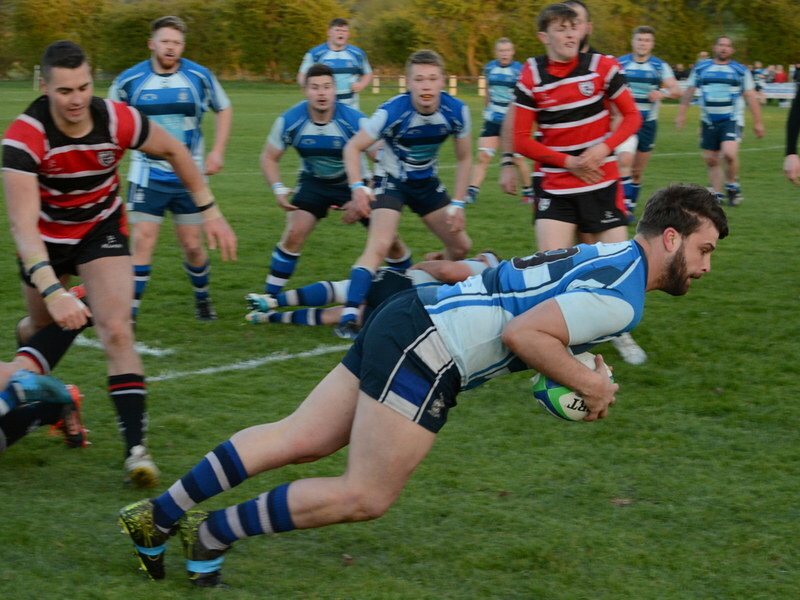 Ensians began to find their footing in the second half, as centre Ollie Eaves and Will Cooper began to find the holes in Ilkley’s well regimented defence. Bateman would come the closest to scoring, however, the away side would hold on to survive ‘Ensians’ early second half pressure. In a neck and neck game such as this one, any clear advantage will show. This was evident in ‘Ensians’ clearly dominant scrum, as they pushed Ilkley to the brink time after time. One such scrum would lead to number 9 Rob Lofthouse coming tantalisingly close to crossing the white-wash, only to be brought down by a horrific high tackle which left the referee with no option but to produce a red card. Ensians could smell blood, and began an all-out offensive. But Ilkley would stand tall, refusing to give an inch. They weren't done yet. However, after a frustrating sequence, an exceptionally smart drop goal attempt by Will Cooper followed by a well-deserved try by Chris Westland would hand the Otliensians a 17-9 cushion, and surely the Cup. Ilkley managed to rally late on, crossing The Ensians’ line through former ‘Ensian Declan Jackson and reducing the deficit to 17-14. Heartbreak was looming. However, ‘Ensians wouldn't allow it, and would hold on to take the game, and the glory, led by man of the match contenders Ollie Eaves and Will Cooper.